Umpire Jerry Layne took a fastball to the mask on a near-direct shot after catcher Russell Martin was unable to corral an elevated pitch, prompting the veteran crew chief to depart Oriole Park at Camden Yards on Wednesday evening. It is Layne's second game-ending head injury of the season. 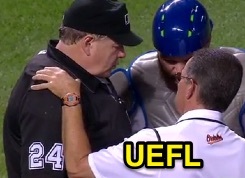 HP Ump Jerry Layne is examined after his hit. With one out in the bottom of the 3rd inning of the Blue Jays-Orioles game, Blue Jays pitcher Aaron Sanchez threw a 94-mph fastball up and over the plate, where it was deflected by catcher Martin directly into the center of HP Umpire Layne's traditional-style facemask. Pursuant to protocol related to head trauma and potential concussion, Layne was replaced for the remainder of the contest behind the plate by 2B Umpire Alan Porter with acting crew chief Hunter Wendelstedt and Scott Barry holding their positions at first and third base, respectively. Layne most recently was forced to leave a game due to a pitched or batted ball to the facemask on June 27, 2016—just one month prior to the present headshot—when a fouled-off 92-mph fastball struck Layne in the right jaw. Layne also suffered a pitched ball deflection from the catcher on April 15, 2015, when Francisco Cervelli was unable to handle a 3-2 fastball.